Klikněte na fotografii a zobrazte všechny dostupné fotografie k Zubara Plaza II. 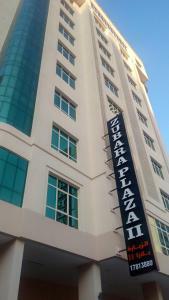 Offering an outdoor pool and sauna, Zubara Plaza II is located in Juffair. The accommodation boasts a hot tub. Juffair Mall is 500 metres away. Free WiFi is offered throughout the property. All units include a seating area with a TV. There is also a kitchen, equipped with a dishwasher, oven and microwave. A toaster and fridge are also featured, as well as a kettle. Free private parking is also available at this apartment. Towels are provided. Zubara Plaza II also includes a year-round outdoor pool. The property also offers grocery delivery. The nearest airport is Bahrain International Airport, 6 km from Zubara Plaza II. Please inform Zubara Plaza II in advance of your expected arrival time. You can use the Special Requests box when booking, or contact the property directly with the contact details provided in your confirmation.